Composed by James Harris, Terry Lewis, and James Wright. Arranged by Mark A. Brymer. Hal Leonard Choral. Choral and Movies. Octavo. With chord names. 7 pages. 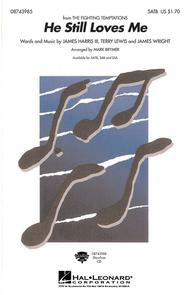 Published by Hal Leonard (HL.8743985). The Fighting Temptations was the movie hit of the summer. He Still Loves Me epitomizes the message of the film. Upbeat, positive and brimming with life, this combination of modern R&B and gospel results in a spiritual song for today. Available: SATB, SAB, SSA, ShowTrax CD. Approx. Time: 2:30. April 28, 2011 Stirring and motivating work! I've used this arrangement with High School Choirs and an adult community gospel choir. It has been popular with choir members in both formats and is a good concert item. Works particularly well if you beef it up with piano, hammond organ, drums and electric bass. July 08, 2009 Where can I get the movie score?? I'd like to know where I can get this score WITH the bridge? I agree, it's unacceptable to not have a complete score. Thanks for warning the rest of us! June 24, 2008 Where's the bridge? Think it's totally unacceptable to sell an arrangement which has a substantial piece of the song missing! The fact that the bridge is just not there is very disappointing, as the piano transcription is very good. Think the alto part is too low though. 43 of 59 people found this review helpful. myself and while conduction, everyone starts playing something else. The intro is not the same as what we have been listening from the movie soundtrack. I felt like I wasted money, really. Well, on the whole it gives the chorus which is not bad. But I deadly needed that left out bit.